What is the one most helpful word in any language? I think it’s a simple “thank you”. So let’s learn how to say it in Russian. This seems simple enough. So let’s look at the correct pronunciation. As you notice, the stress in the word спасибо falls on the “и” sound leaving the “о” unstressed. In Russian, unstressed “о” sounds like “а”. That’s why you will hear Russians pronounce it as spa-SEE-ba. Note that you may often find it written phonetically as spasiba. Sometimes this simple спасибо is enough, like when someone holds a door open for you or passes you a plate of hot home made пельмени (pelmeni; meat dumplings). 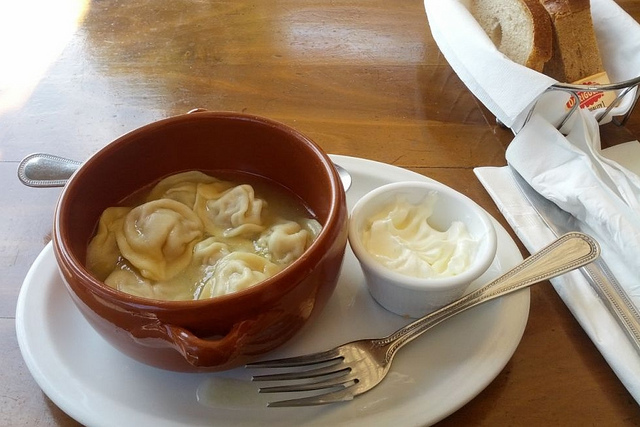 Of course, if you really like pelmeni, you might say большое спасибо (thank you very much) [balʹshoye spasiba]. If you really love them and been waiting for this treat for years, you might even say огромное спасибо (thanks a ton; lit: a giant thank you) [agromnaye spasiba]. If you are not a fan of dumplings, things get a bit more complicated. At a restaurant you can decline a dish with a simple нет, спасибо (no, thank you) [n'et, spasiba]. But if you are at someone’s home, being вежливый (polite) obligates you to taking at least a tiny bite of food. Only then, as you are offered more, can you say спасибо, но я уже наелся [masculine]/наелась [feminine] (thank you, but I am full). Я Диме помог, а он даже спасибо не сказал – I helped Dima, but he didn’t even thank me. But when it comes to work for pay, работать за одно спасибо (to work for just a “thank you”) is not something Russians are eager to do. After all, спасибо в карман не положишь (you can’t pocket a “thank you”), из спасибо шубу не сошьёшь (you can’t make a coat out of “thank you”) and спасибом сыт не будешь (you can’t eat a “thank you”). По дороге домой у нас закончился бензин. Спасибо, до заправки было всего ничего. (On the way home we ran out of gas. Thankfully, a gas station was close by). Отказывать было не вежливо и мне пришлось есть пельмени. Спасибо ещё, что я не вегетарианец. (It was impolite to refuse and I had to eat pelmeni. At least I’m not a vegetarian). Пожалуйста, comment with your questions and examples. Большое спасибо! Chris, it’s great that you are learning Russian! We have quite a few audio files on the site with recordings by native speakers. Check out the links in the post. That goes for anybody else who would be willing to teach me Russian. I am still new and clumsy at Russian, and would appreciate any advice from anyone at this site for hints on memorizing words and how to use the imperfective/perfective forms of verbs, and how the prefixes c-, po-, y-, and pere- (no Russian fonts on my machine). Bolshoe spacibo, an d have a great day! Hi Sharon, I’ll try to answer some of these questions in the upcoming posts.